Little Owl races through the forest looking for a friend. The sun is going to sleep and she knows it will be dark soon. Little Owl flies to see Cardinal, then Chickadee, then Robin, and then ... but, all the woodland birds are going to bed! 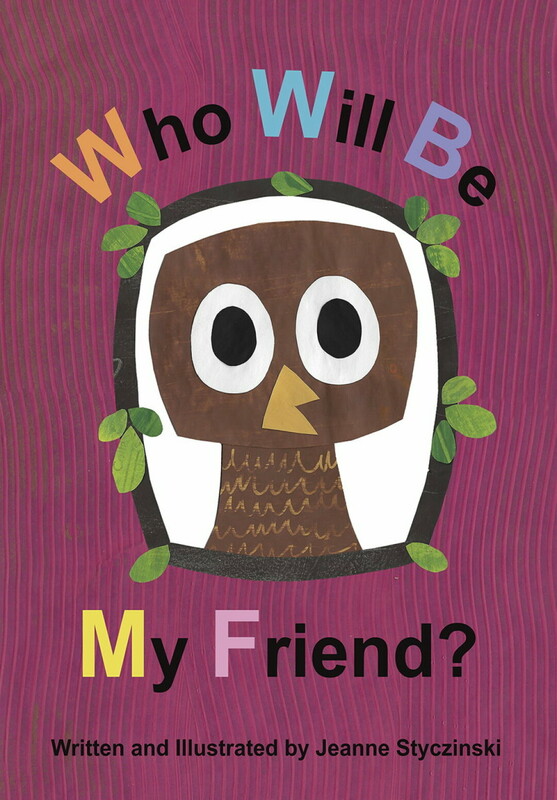 Who will be Little Owl’s friend? As darkness falls, she discovers a friendly Firefly wants to be her friend. Little Owl has never played with a Firefly before; this is her chance to make a new friend! Little Owl and Firefly fly off together and a glowing friendship begins, despite their differences. Written about 10 years ago, Who Will Be My Friend? was one of several stories Jeanne created for her kindergarten students. After she retired from the Menomonie School District, those stories sat stashed away in a folder. 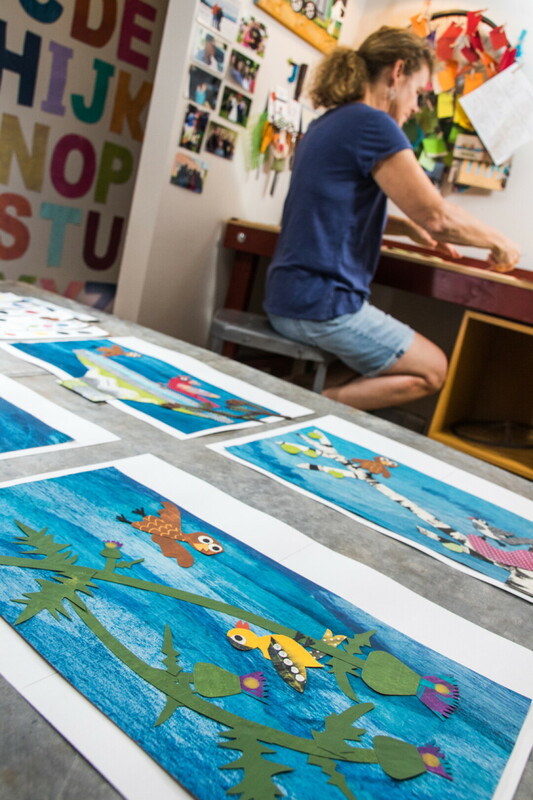 Only recently did Jeanne add her whimsical illustrations to the story, which she creates by painting local newspapers with bright acrylic colors. This upcycled paper was then cut into shapes for her collages, and some of the newsprint intentionally shows through. Sharp-eyed readers will notice glimpses of the words “Friend” and “Cooperative” hidden in the artwork. If her previous books are any indication, Who Will Be My Friend? is poised for success. Her first book, Mama, How Does The Wind Start to Blow?, is in its third printing. The initial print run of 1,000 copies sold out in just four months. Jeanne describes her second book, Papa, Why Does The Sun Shine?, as a sequel, or “innovation,” of Mama: “So different, but illustrated the same.” Both Mama and Papa won Moonbeam Children’s Book Awards in the Alphabet/Counting category. Jeanne’s art is not confined to the pages of her books. 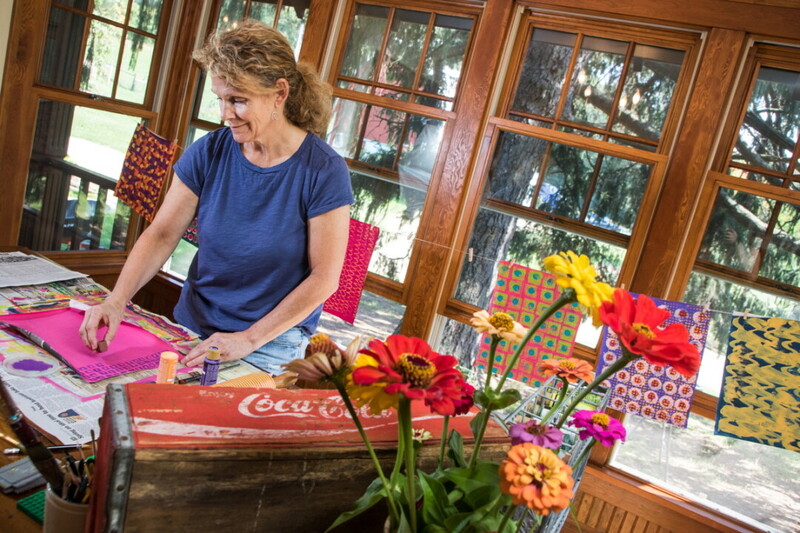 Through her involvement with Arts Integration Menomonie – a collaboration between UW-Stout and the Menomonie School District – she was a lead artist in creating a mosaic at Wakanda Elementary School. The mosaic covers four columns in the cafeteria, with each column representing one of the seasons. “It’s heartwarming that I can still work with children,” she says. Jeanne has self-published all her books, allowing her the creative control to be both writer and illustrator. She found that not many traditional publishers were willing to look at her artwork. For Jeanne, her words and artwork are intertwined and inseparable. Self-publishing also means that she must do her own marketing. Jeanne just spent 11 days at the Wisconsin State Fair promoting and selling her books. Overall, most sales have been in Wisconsin, but she’s had customers in Africa, Australia, and Germany. As a new beekeeper, Jeanne’s two hives of “little honeys” inspired her next book, Little Bee’s Flight. That story will detail a bee’s journey as it collects pollen, and is currently in the professional critiquing stage. Little Bee’s Flight is set to hit shelves in a year. Jeanne Styczinski’s books can be purchased online at MrsJeanne.com or at locations such as The Local Store, 205 N. Dewey St., Eau Claire.